Pat's Scraps: Old and New! So I've been wanting to try making a flip card (new for me! ), and for Christmas, I received a new set of Spellbinders Nestabilities Circle dies. The paper I used is old; got it when I first started my blog 3 years ago. It is DCWV Cafe Mediterranean solids and patterns, 2 different stacks. There are lots of tutorials out there on flip (or swing) cards. My folded card size is 5 x 6. I placed my circle on the "front side" of the card and scored above and below it at 2.5" (half the width of the card) and then 3/4" to the right of that score line. I then ran it through my Big Kick, cutting the circle up to each fold line, leaving the 3/4" strip intact. That's what makes the circle "flip." Then I went to work covering the card with the patterned and plain papers. The flower in the center is cut from the Art Philosophy cartridge with a scalloped circle behind that. Following are various stages of opening the card. And when you turn it over, it looks like this! Hope that may have helped give you some perspective on making a flip card. 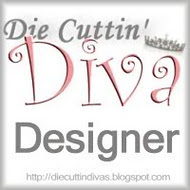 Now come and join the challenge this week at Die Cuttin' Divas. Use something old and something new in your project, and tell us what that is. Be sure to use a die cut and link your post to the DCD blog site. We'd love to see what you come up with! This one pops!!! Great tutorial! Love that you posted a tutorial for your BEAUTIFUL card!! I am going try this out!! Beautiful! I love the colors you've used and the flip. Love the tutorial. Fabulous job! Fabulous card, Pat! I love the papers and color combo you used! Have a great day. WOW! what an awesome card Pat and I agree with all the ladies above that the colors you chose are fabulous:) Have a fabulous weekend! Wow, Pat. I loved your take on this challenge. Great job on your card and love the colors.